Colin Farrell is just one of many celebrities who has offered Charlie Sheen support in the wake of him being dropped from the current season of “Two and a Half Men”. Sheen told NBC today that the Irish star had called around to the actor’s house to offer his support. In another bizarre move, after been dropped from the popular show Charlie Sheen took a wander down to his local tattoo parlor for his latest tattoo, in honor of his father Martin. Charlie got the words “Death from Above” etched on his chest, underneath is an apple and a single drop of blood. The troubled actor explained its significance during a radio interview on the Alex Jones Show. "[It’s] the banner from the death card that Kilgore [from Apocalypse Now] is throwing on his victims, but there’s also falling from it, is the apple from The Giving Tree. "There’s my life. Deal with it. Oh wait, can’t process it? Losers. Winning. Buh bye," he said. In his latest explosive interview with NBC’s Today show the actor demanded a 50 percent pay rise. “I’m a man of my word. So I will finish the TV show, I will even do season ten, but it’s at this point because of psychological distress, oh my God, it’s three mil an episode, take it or leave it. 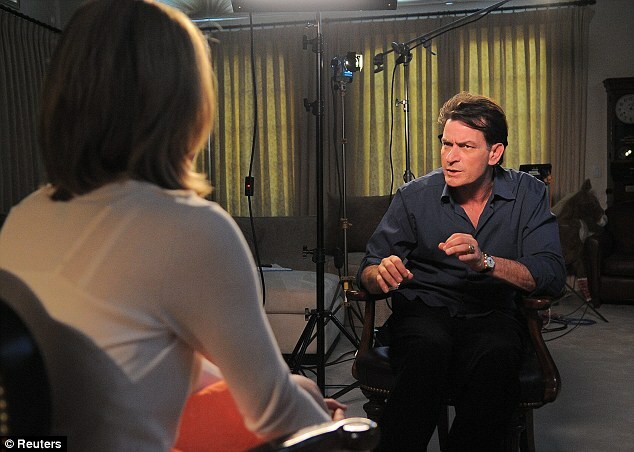 Sheen says he wants a raise from his two million an episode salary “because of the pain they put me through”. “If you look at the money they are making it’s ridiculous, I'm tired of pretending I'm not special,” he added. When asked if he was clean, a disheveled Sheen replied: “Look at me d’oh, drug tests don’t lie. When asked when was the last time he did drugs Sheen responded “Don’t remember, don’t care, drug tests don’t lie. “I’m not angry, I’m passionate. Everyone thinks I should be begging for my job back but I am going to forewarn them, that it’s going to be everyone else that is going to be begging me for their job back,” he said.